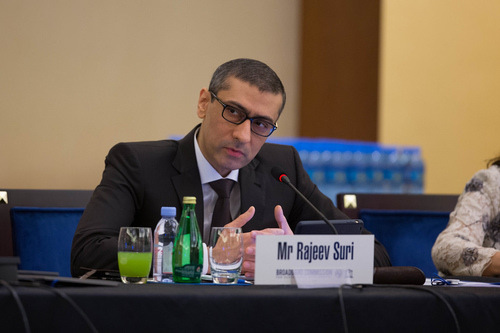 Nokia CEO Rajeev Suri has warned investors the 5G market will grow at a slower pace this year than previously expected as operators "stagger" their rollouts and the industry tackles remaining technical challenges. The update came as Nokia Corp. (NYSE: NOK) reported a strong set of results for the final quarter of 2018, with both sales and net profit up 3%, to €6.87 billion (US$7.9 billion) and €741 million ($852 million), compared with the year-earlier quarter. Despite the improved performance, Nokia has lowered its outlook for the main addressable market this year to "flattish," having previously guided for growth, and says it expects the first quarter of the year to be "particularly weak." "Part of that is that there will be staggered rollouts of 5G in lead countries such as the US, Japan, China and Korea. You will not see full-year rollout in these countries," Suri told reporters on a call this morning. "Second is the ecosystem of 5G around standards and chipsets and devices at scale -- and getting software to interoperate with all this -- is still evolving." Those remarks have come as a disappointment to investors who were expecting a burst of 5G activity in 2019 after witnessing declines in network spending in recent years. Nokia's share price was down 5.5% in Helsinki this morning following the release of its latest earnings report. Suri: A smart speaker, but not to be confused with Siri. An explanation given by Kristian Pullola, Nokia's chief financial officer, suggests that 3GPP delays and an interoperability problem uncovered by Light Reading are having a bigger impact than previously assumed. "The 5G ecosystem is still evolving and we are still having updates to the 3GPP standards and as a result of that there is still a lot of work between different ecosystem players that needs to happen, be it ourselves, the chipset vendors or the device makers, to ensure interoperability is there and that we can start scaling the ecosystem and get it into broad-based use by consumers," he told Light Reading. Suri was equally coy on today's call. "Frankly this is not the time to comment on that topic when the situation is in flux and the outcome is for governments to decide and not Nokia," he said. "If customers ask for support we will give it but at this point we are monitoring developments." While the 2019 outlook is for no growth in the main addressable market, Suri expects Nokia to outperform rivals and said it had outgrown and delivered a better operating margin than its nearest competitor -- a likely reference to Ericsson. For the full year, Nokia's operating margin fell to 9.7%, from 11.1% in 2017, against a 2018 target of 9-11%. The networks business also just hit a target of 6-9%, falling from 8.3% in 2017 to 6% last year. Ericsson last week reported a full-year operating margin of just 0.6%, but the figure was up sharply from -16.9% in 2017 after a fierce wave of cost-cutting and thousands of staff layoffs. Nokia has just wrapped up a program designed to reduce annual operating costs by €1.2 billion ($1.4 billion) between 2015 and 2018, but that initiative does not appear to have delivered sufficient long-term benefits. Nokia employed 101,731 people in 2017, including 39,057 in Finland and the rest of Europe, according to its annual report that year. It has yet to provide details of headcount in 2018. On the sales front, Suri has long trumpeted Nokia's range of products and involvement in all areas of the equipment market as an advantage over Ericsson, which remains heavily focused on the mobile networks business. The rationale is that any transition to 5G will force operators to make investments outside the mobile space, in areas such as optical networks and IP routing, to ensure there is underlying support for new 5G services. Another eye-catching part of Nokia's strategy has been the expansion into the enterprise sector, which Nokia expects to grow at a much faster pace than the telco market over the next few years. Suri revealed on today's call that Nokia currently has about 1,000 enterprise customers and put the rate of sales growth in constant-currency terms at about 9% currently. Following telco investment in 5G services, he is anticipating a "second wave" of spending by industrial customers on private wireless technology, he said. "This will be of unique benefit to Nokia because we're the only player with an end-to-end portfolio and presence in all key markets," he said. At the networks part of Nokia, which accounts for about 90% of total sales, revenues were up 7% in the final quarter, to around €2.65 billion ($3.1 billion), compared with the year-earlier period, thanks to a strong performance on the mobile side. The operating margin for the networks business also grew sequentially, soaring to 13.5% in the fourth quarter from 5% in the third. A recent bright spot for Nokia was the performance of its fledgling software business, which reported sales growth of 12% in the fourth quarter, to €534 million ($614 million), compared with the year-earlier period. "This had healthy profitability and Analysys Mason [a market research company] has rated Nokia as the leading telco software business," said Suri.